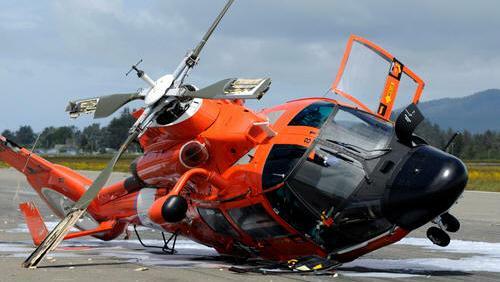 April 30, 2010 - Three Coast Guard aviators are safe after a Coast Guard helicopter from Air Station Humboldt Bay crashed at Arcata Airport at 10:55 a.m., Thursday. The helicopter had three crewmembers aboard when it went down during a training mission. The crewmembers were uninjured. The MH-65C Dolphin helicopter crew was conducting a training mission at the time of the incident. All three aviators walked away from the incident and were examined by emergency medical personnel at the air station. None of the crew sustained serious injuries. An initial investigation will be conducted by the air station's safety officer. A mishap analysis board from Coast Guard headquarters will be assigned to investigate the cause of the crash further. The HH-65 Dolphin is a twin-engine, single main rotor, MEDEVAC-capable, Search and Rescue (SAR) helicopter operated by the United States Coast Guard (USCG). It is a variant of the French-built Eurocopter Dauphin. The HH-65A's minimum equipment requirements exceeded anything previously packaged into one helicopter weighing in at less than 10,000 pounds. 75% of the HH-65's structure — including rotor head, rotor blades and fuselage — consists of corrosion-resistant composite materials. Some Coast Guard pilots have nicknamed the Dolphin as "Tupperwolf", a portmanteau of tupperware (because of the aircraft's high composites content) and Airwolf (from the 1980s TV series). Also a unique feature of the Dolphin is its computerized flight management system, which integrates state-of-the-art communications and navigation equipment. This system provides automatic flight control. At the pilot's direction, the system will bring the aircraft to a stable hover 50 feet (15 m) above a selected object. This is an important safety feature in darkness or inclement weather. Selected search patterns can be flown automatically, freeing the pilot and copilot to concentrate on sighting & searching the object. A distinctive feature of the HH-65 is its tail rotor. Its 11 blades spin inside a circular housing at the base of the helicopter's tail fin. Certified for single-pilot instrument flight rules (IFR) operation, the HH-65A was the first helicopter certified with a four-axis autopilot, allowing for hands-off hover over a pre-determined location.